This set features great designs from the past including 1993 SP, 2004 Legends, and 1995 SP Top Prospects. 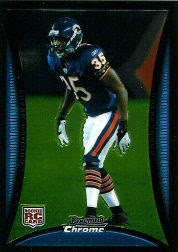 Keeping all of that in mind rookie cards are plentiful and a box is a very affordable $55. There are definite hot packs considering the average pack should yield six short prints and on a few of them I beat the odds. There are eight cards in every pack and some of them had some interesting results especially the one that had four different Kosuke Fukodome rookies. To all my readers a very safe and Happy Thanksgiving. It's very easy in the hustle and bustle of daily life to forget the things we are thankful for. This nation, even in challenging times of war and economic uncertainty has been blessed like few countries ever have. So raise a glass to freedom and thank the Man Above for the simple things we take for granted that millions around the world could only dream of. Many of us spend more money on trading cards in a month than many people around the world make in a year. Keep that in mind the next time you "just have to have it." 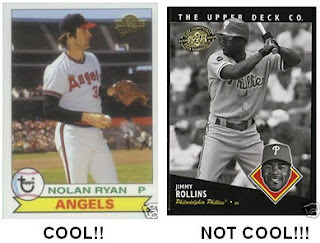 Topps Heritage doesn't count against them because they aren't utilizing card designs from the last 20 years. They are using classic designs some from 50 years ago. It truly honor their "heritage" in the hobby as opposed to simply retreading an old design. Maybe it's a double standard but it's just my opinion. 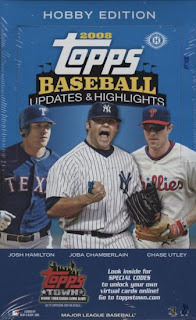 Products the likes of Upper Deck Timelines and SP Rookie Edition have to go. Utilizing current players on past designs isn't cool it's just incompentent. This is nothing more than sheer laziness on the part of the production and brand managers at Upper Deck. 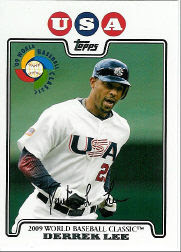 Kudos to Topps, who have thus far, resisted the urge to utilize this tactic to cut costs and save money. It's one thing to capitalize on your storied history in the hobby by releasing retro sets like Topps Archive and Topps Fan Favorites featuring retired greats of yesteryear, it's entirely another, to after a whopping 19 years in business, to march out over-produced card designs from the early and mid-90's and slap photos of current players on them. November 24th, 2008 - Check out this edition of Hockey Hour. We discuss, third jersey's, head shots with some great clips of Simon Gagne talking about just that, and who are the better teams in the East and the West. Click here you won't be sorry. I'm sorry, but there is no way in hell that this card should be graded, EVER. Whose the idiot that is going to buy this? This Guy is Insane, Stupid or the World's Greatest Set Collector. Blatantly cut and pasted from SCD's website. I would have provided a link but there is an error on the page. 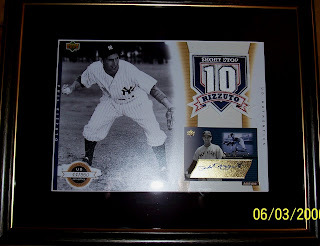 Tommy Baxter becomes first to complete UD's Yankee Stadium Legacy set. Says it took $15,000 to get all the cards in the set. Gets the opportunity to meet Derek Jeter, among other prizes. Tommy Baxter, a 36-year-old precast concrete specialist from Little Rock, Ark., has just accomplished something no one else in the world has been able to do: put together Upper Deck’s gigantic 6,600-plus card Yankee Stadium Legacy (YSL) collection. Baxter, an avid Cubs fan, seized the opportunity to become the first collector to piece together Upper Deck’s enormous insert set, which pays tribute to every single Yankees home game ever played at the historic venue since its doors opened on April 18, 1923. “I’ve put together plenty of Upper Deck sets in the past, so I figured this was just one more to complete,” said Baxter, whose 11-year-old daughter, Madeleine, helped him sort and collate the thousands of cards. 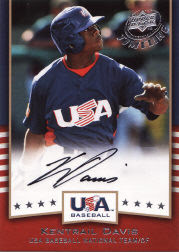 “I really didn’t take it seriously at first, but once I got through that first series of inserts, I knew I had to finish it.” That first series of insert cards appeared in Upper Deck’s 2008 Series One Baseball set, which released on Feb. 5. That’s when Baxter got started. The cards fell at a ratio, on average, of one in every four packs. Within two weeks, he had collected 200 of the YSL cards; he only had 6,461 to go! 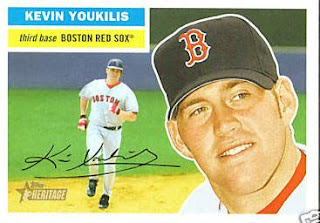 Nine more Upper Deck baseball trading card products were released over the course of 2008 that have each contained various YSL cards from the overall set. Baxter’s feat, therefore, is a study in patience, persistence and stick-to-itiveness. It also proved to an expensive pursuit. “I would estimate I spent a little more than $15,000 putting this set together,” said Baxter, who mentioned he finished the set the night before Halloween. “I remember it was a Thursday, since those were the days we’d collate the cards. Madeleine would go through and sort the cards every week. That night we knew we had this thing licked.”It would have been sooner, but despite his best efforts with buying and trading the cards with collectors from as far away as Taiwan, there was one single card that eluded him: No. 4,272. “It had Ron Guidry on the front. I couldn’t find that card anywhere. Nobody had it,” said Baxter. 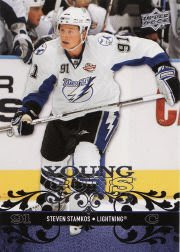 He was recording each of the YSL cards online at a special website Upper Deck debuted earlier this year, www.ownthelegacy.com. He was watching his numbers climb almost every day, but No. 4,272 was nowhere to be found. But where there’s a will, there’s a way. Inside of October’s final week, Baxter received the card from collectors in New Jersey and Florida. “I couldn’t find that card for seven months and then I got four of them within a week,” he said. Once he had the complete set in hand, he quickly packaged up his work and shipped it off to Upper Deck headquarters in Carlsbad, Calif., for verification. Upper Deck staffers Chris Carlin, Terry Melia and Carrie Peterson certified the contents of Baxter’s shipment. “All the cards are in,” said Carlin, Upper Deck’s hobby marketing manager. “Tommy’s accomplishment is incredible. He’s the first person to complete the set, so we’re ecstatic and very happy for Tommy and Madeleine.” Baxter’s prize for completing the entire set of insert cards is multi-tiered. He and his daughter will receive an all-expense-paid trip to New York City in the spring at which time they will take in a Yankees game at the new venue and meet Yankees Team Captain Derek Jeter. In addition, since 2008 marked the final MLB season in the old stadium, Baxter will receive 81 additional YSL cards chronicling the Yankees’ last campaign which brings the grand total of games played (and cards produced) to 6,742. And, of course, he will get all of his cards back to display proudly at home. “You know, I was never really a big Yankees fan, but I did always admire Don Mattingly,” said Baxter. 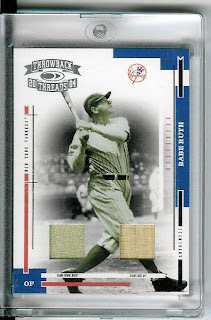 “I liked his work ethic and I guess I always had a penchant for guys who could hit over .300 every year.” Upper Deck still has four prize openings left for any other collectors who are able to piece together the entire Yankee Stadium Legacy Collection. The word is there are a few people who are just single digits away. When you have been a CFL collector as long as I have, you can’t help but feel like you’re on a roller coaster.Year-in and year-out, there has been the JOGO set, primarily distributed as a boxed product with an extremely limited quantity. At various times though, other companies have entered the market, such as All World and Pacific that bring genuine collectability to the Canadian game, but usually they’re only around for a year or two, then disappear. 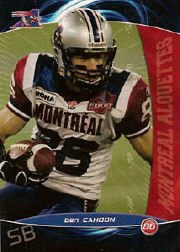 Not since the days of Topps/OPC has there been a long run of CFL sets not produced by JOGO. As a kid, from age 6-12, I collected baseball cards for the same reasons many of us did, as a way to be connected to my favorite teams and players. I have always loved baseball and grew up a fan of three teams; the Cubs, White Sox, and the LA Dodgers. Although I am from Chicago, my Grandma was a huge Dodgers fan and I fondly remember watching the 1978 World Series with her rooting for Steve Garvey, Davey Lopes, Bill Russell, Ron Cey, Kenny Landreaux, Dusty Baker, Steve Yeager and Pedro Guerrero, while they battled Reggie Jackson and the Evil Empire. When I re-entered the Hobby in the fall of 2000, after taking a typical hiatus in my teens and 20's to pursue girls, partying, college, and travel, I must say I was a bit overwhelmed to say the least. One day a friend of mine asked me, "Hey, when was the last time you were in a baseball card shop or have seen a baseball card?" The answer was obviously not in a very long time. I remember him showing me a Roger Clemens card with a piece of fabric embedded in the card. I asked him what it was and when he replied, "A piece of a jersey he wore in a game. ", I was floored. He then proceeded to show me cards with autographs on them from Ryne Sandberg and Tony Gwynn and at that moment I was hooked. From the cancelled World Series, due to the player's strike in 1994 (I was still bitter until the Sox when in '05 because they were unstoppable that year) until the Home Run Chase between Sosa and McGwire in 1998 I had boycotted baseball, disgusted that the greed of both the players and owners caused a World Series to actually be cancelled. With baseball having received my forgiveness, combined with being turned onto a whole new era of collecting and having disposable income as a YUPPIE DINK (Young Urban Professional, Dual Income No Kids) I dove head first back into the Hobby. The first 3-4 years were a whirlwind, I wanted it all. I was dumping $300 or more a month on new product, tickled pink with every memorabilia, serial numbered card, die-cut, refractor, autograph, and complete base set I accumulated. It wasn't long after that before I began to question if that was all I was really doing, accumulating, versus actually collecting. I continued with my habits for another year. Then my first daughter was born. Diapers, formula, clothes, etc quickly ate into my Hobby budget. It was time to take a good hard look at my "collection" and determine, "What DO I collect?" My second favorite sport is hockey. I love the speed of the game and the grace of the play making, the aggressiveness and the sportsmanship. Being from a town that hosts an Original Six franchise with the storied history that the Blackhawks do, it was easy to get hooked on hockey. Because I love the sport, I also collect key RC's of the league's best players. While I am still a sucker for busting packs and boxes, discretionary income is nearly non-existent now with 2 kids, I have to stay focused. Being a player collector is tough today. There was a time when it was possible to collect every single card of a player ever produced. The 1-of-1 changed all that, but that's OK. Outside of set building I have never had that "completist" thing that a lot of collectors feel. So I enjoy my Ripken, Ryan, and Shoeless Joe collections for what they are. One of the great things about collecting is that it is something my wife enjoys as well. When we first met in 1998, she was, and still is, a HUGE baseball fan. She helped me work through my grudge against the sport. She is from Ohio and a huge Indians fan. Her favorite player, has and always will be, despite being older and playing in San Francisco, Omar Vizquel. I turned her onto the Hobby and she has one of the most impressive Vizquel collections. Because he is not collected like Ripken and Ryan. she has multiple autographs and even game used bats, 2 in fact!! I will never in my life, be able to afford real game used memorabilia for my player collections. So that's what I collect, why and how. Now, anybody up for a trade? Oh . . and yes, I'm still a sucker for modern cards from that legendary Dodgers team of my youth. The release of 2008 Updates & Highlights (henceforth in this article referred to as UH) provides the final chapter in what turned out to be a very exciting baseball season. 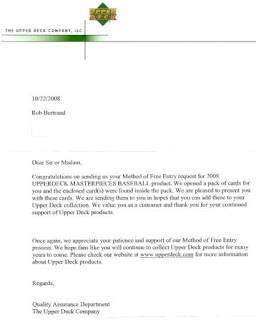 Serving as what could be called Series 3, UH provides collectors an additional 330 cards to complete their base set for Topps flagship brand in 2008. The checklist includes 197 traded players, 45 previously unreleased rookies, 10 season highlights, 60 All-Stars, 8 Home Run Derby cards, and 10 Classic Duos. McFarlane Toys will soon release NFL Wave 3 and if collector’s ride this one they will find it to be one of the most interesting and satisfying sets to date! Sometimes I amazed at the hype some players get. It happens in all sports. Who are your nominations for over-rated player? Here are some of mine. Current players only, we'll look at an All-Time Most Over-Rated list at some future date. 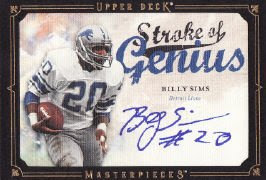 Gellman at Sports Cards Uncensored had another great idea (Does he work? I can't keep up with his level of blog creativity. Just kiddin' Gman you know I love ya) Anyway, check out his idea about the Bat Around. I will be posting my contribution so be sure to check it out on Friday. Kind of makes this (my best pull EVER) seem kind of ordinary. 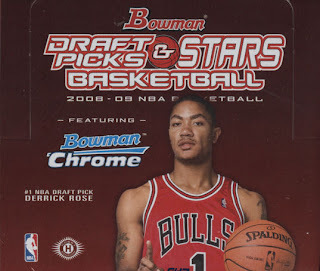 Outside of baseball, Bowman still remains, “Home of the Rookie Card”. Another annual release eagerly anticipated by thrifty NFL collectors. 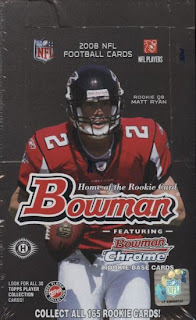 Bowman provides budget conscious collectors a multitude of rookie cards, and, as with the Bowman brand in other sports, ’08 NFL utilizes the (2) chrome cards per-pack break out. “Chromies” will love the fact that those (2) cards are both RC’s. So instead of having to wait for a Chrome version later in the year, collectors can kill two birds with one stone. OK I was wrong. I have become so jaded with my hatred and loathing of that hobby nemesis in Texas that apparantely it has affected my hearing. I hereby resign from blogging . . . . . .
Gellman- Sportscards Uncensored, Mario- Wax Heaven, Dave- Fielders Choice, and PapaJV- Treasures Never Buried are the bloggers whose opinions I most listen too. Mario has sounded off on the Back on Topps episode but I am still waiting for at lease Gellman to render his opinion before issuing a retraction. I kid you not. Listen to the newest webisode of Back on Topps. Between the 1:40-1:45 time mark the brothers make the comment, "Baltimore hasn't won anything since the Reagan administration, they could really use the help. So can Beckett." Am I hearing things? OMGLMAO!! Thanks to this report by Sports Collectors Daily. I am very happy to see some level of common sense still prevails in doing what's right. The old-timers helped transform the NFL into America's new National Pastime and turn it into the multi-billion dollar industry it is today. "A federal jury ordered the NFL Players Association to fork over $28.1 million for refusing to cut retired players in on their marketing deals. " Sorry about the audio level. Be sure to turn the volume WAY up. Locked in a room for all eternity, with all senses intact, less the need for food and water, bombarded by the constant streaming of bad Video Box Breaks on a large flat panel TV, featuring the satan of the Hobby himself. 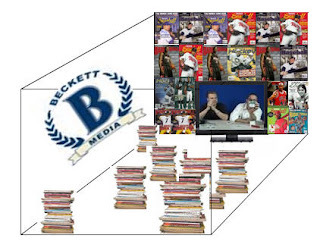 The decor features a huge FatHead of the Beckett logo and the rest of the room is wallpapered in past issue's covers. The only thing to read is the entire Beckett library including new issues which simply materialize. HELP ME!!!! The first thing I noticed after cracking open a few packs was the fact this set doesn’t cover the NFL exclusively and then a card hit me, it smacked me right in the face, it was a Doug Flutie card back from his BC days. A few weeks ago I posted a piece on getting free stuff. One of those ways was UD's new online No Purchase Necessary entry form. 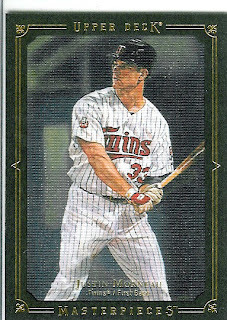 A brown border framed parallel of Justin Morneau from '08 Masterpieces. Who are the only two players in NBA history to start a season with 20 points and 10 assists in their first 5 consecutive games? 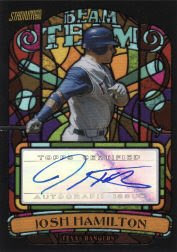 The trend of including valued-added items to sports cards hobby boxes was first repopularized by Topps with both 2001 and 2002 Topps Reserve. 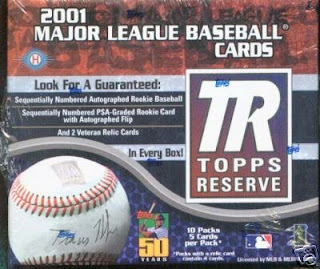 2001 Topps Reserve Hobby boxes contained an assorted autographed baseball. 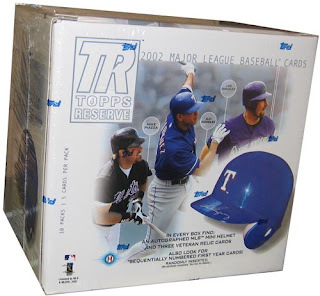 Following the success they found in '01, Topps re-issued the brand in 2002 and included one autographed mini-helmet per box. Unopened material is fairly difficult to find, but I have found a few of each with prices ranging for 2001 from $137-$150 and $81-$130 for 2002. This was one of those products that if you purchased at retail and pulled a common you were bumming but psyched if you pulled even a semi-star, let alone an A-Rod, Bonds, etc. Collectors can’t always get the hobby equivalent of a hat trick every time he or she opens a box of trading cards but what the companies can do is give them the kinds of odds that they are comfortable with and then they are happy to chase the big whales knowing that they will pickup some good smaller stuff along the way. 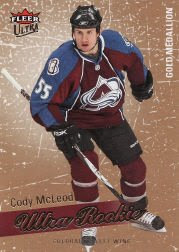 2008-09 Fleer Ultra Hockey gives collectors value and when their box is completely opened they will get some solid cards and one card they won’t mind waiting on. 2003 was a great year for added value. When Sy Berger and Arthur Shorin were running the Topps monopoly back in the day, could they have in their wildest dreams and/or imagination foreseen the day when something like this would be included in a box of trading cards. 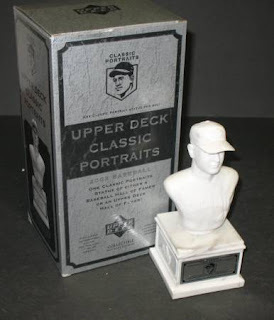 Upper Deck Classic Portraits included these beautiful mini-busts in both Hockey and Baseball. Not content with a simple marble bust, for the baseball line UD included variations in pewter and bronze as well adding a distinctive chase element to the program. Not content to sit on their laurels, the hockey version included painted figures with some even holding the heralded Stanley Cup overhead. This is again a tremendous example of going above and beyond and adding a very unique collectible to a standard trading card brand. 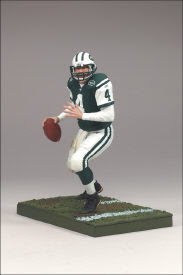 If looking for one of your favorite player, you might want to do a saved search with email notification because while eBay always seems to have a dozen or two listed, finding your specific player on the first go is probably a long shot as theses bust have proven VERY popular with player collectors. Good luck finding this product in new sealed boxes and if you do expect to pay over $150 per box. Here are the current eBay listings. Also try searching just Classic Portraits from time and carefully search the listings as I have found them without the word "bust" in the title.